Quite a famous picture - often reproduced. Anybody know who the girls are? The large version is a postcard supplied by James Barr. He says the "card is postmarked 'Cromarty June 20, 1903' with arrival postmarked 'Blankenese June 22, 1903'. Blankenese is a southern suburb of Hamburg, Germany overlooking the river Elbe. Message is written in German." 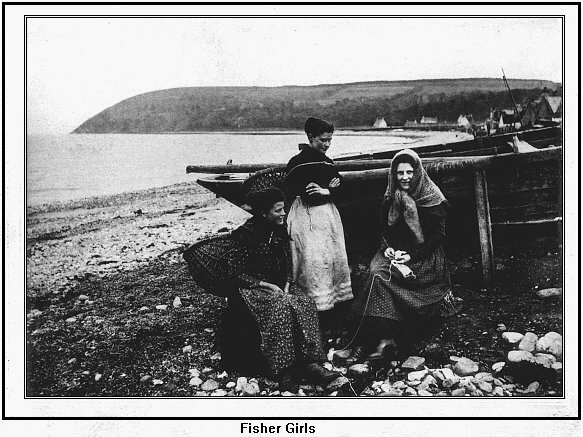 I Think this is a stunning Picture of early Cromarty Life..I believe John Bain was a keen photographer and as a collector of Early Cromarty Postards ..i have seen his name appear on a number of them..Please has anyone got more information about the man himself? a postcard in German from near a major british naval harbour during a period when the UK and Germany were in a naval arms race...curious!!! wonder what the message says...hints of spying perhaps! Shelia is on the ball! certainly is a coincidence, however with the lack of ministerial info on this disaster, we will never know. My uncle P.O John Baylis lost his life 21 years old. Lets get this site up to date, at 81 Im one of the last direct family connection with memories handed down. Lest we forget .